The first photo showing the look of the new Spider-Man film coming 2012 was released today. It shows actor Andrew Garfield walking down a dark alley, looking very beat. There are a couple of things to point out about the suit. First, I’ve heard a lot of complaints about the look of the spider on the chest. To me, the suit looks to be damage in a fight, and we can see bloodied scratches on his face to support this. We also know from reports that The Lizard will be a villain in the film, so these battle scars could be from an encounter with him. Also, if you very carefully, you’ll notice small bumps on his wrists, which could possibly suggest the presence of mechanized web shooters. Some other Spider-Man news came today. Activision announced that Beenox, developer of Spider-Man: Shattered Dimensions, will be in charge of the publisher's future Spider-Man titles. Spider-Man: Shattered Dimensions received fairly good reviews, so its my hope that Beenox will good as well, if not better, on future Spider-Man releases. Many might complain that no Spider-Man game will live up the open-world gameplay of Spider-Man 2. I personally have not played Spider-Man 2 or Shattered Dimensions yet, but from what information and footage I saw of Shattered Dimensions, it looks like they handled the idea of four different Spider-Mans pretty well, this coming from a long-time Spider-Man fan that still has his comics somewhere in storage. 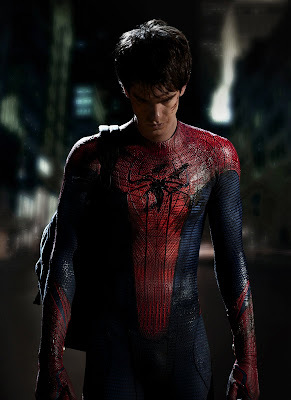 I wish spiderman wear mans suit so he look more elegant.